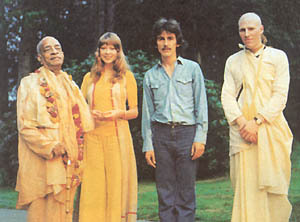 His Divine Grace Srila Prabhupa felt such a strong connection to George Harrison that he designated him his "Arch Angel" and gave him the name Sri Hari Georgeson. Such was His Divine Grace's deep affection for this extremely important and wonderful soul,George Harrison. It is also known amongst inner circles that before Srila Prabhupada passed away he took off his hand made blue sapphire ring and told the Sanyasis there to "give this to George Harrison". This was some time after Srila Prabhupada had recieved little or no contact from Sri Hari Georgeson, yet His Divine Grace still retained a powerful recongition of him and humble gratefulness for his transcendental service as his Arch Angel.